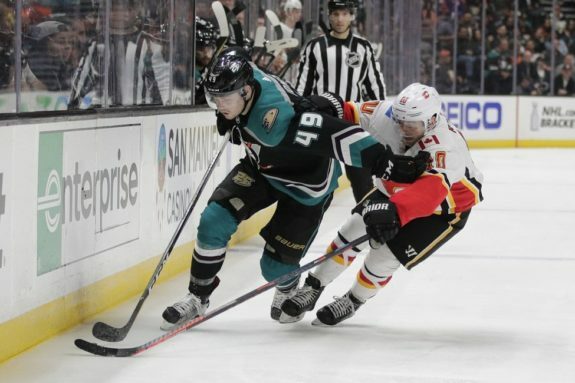 ANAHEIM, Calif. — Rookies Sam Steel and Max Jones scored first-period goals and the Anaheim Ducks continued their strong finish to a lost season with a 3-1 victory over the Calgary Flames on Wednesday night. Captain Ryan Getzlaf also scored and Ryan Miller made 25 saves in his first victory since March 5 for the Ducks, who responded to a 6-1 loss to first-place Calgary last week with their 10th win in 16 games overall. Anaheim’s streak of six straight playoff appearances will end next week thanks to its disastrous 5-21-4 midseason slump. The Flames’ three-game winning streak ended, and they lost at Honda Center for the 32nd time in their last 33 games in Orange County. Calgary had lost 29 straight games in Anaheim since 2006 before a win early last season. The Ducks jumped ahead 2-0 just seven minutes in with goals from two of their several promising rookies. Steel scored for the first time since his hat trick March 26 in Vancouver, while Jones got his second NHL goal to end an 11-game scoring drought. Getzlaf, who missed the Ducks’ previous four games with an injury, pushed the lead to 3-1 in the second period with a masterful hesitation shot. NOTES: Ducks F Carter Rowney had two assists in his first multi-point game since Jan. 13. … Lindholm missed his first game of the season, while Monahan sat out for only the third time. Calgary D Mark Giordano, T.J. Brodie, Travis Hamonic and Noah Hanifin sat out their second straight games. C Sam Bennett sat for the eighth time in 10 games. He took a big hit Monday night in Los Angeles, but isn’t thought to be seriously injured. … Anaheim D Josh Manson missed his third straight game with an upper-body injury. C Ryan Kesler remained out since March 6 with a career-threatening hip problem.